The Lion King. Directed by Roger Allers and Rob Minkoff. Performed by Jeremy Irons and James Earl Jones. Produced by Don Hahn. Screenplay by Irene Mecchi, Jonathan Roberts, and Linda Woolverton. Walt Disney Pictures, 1994. 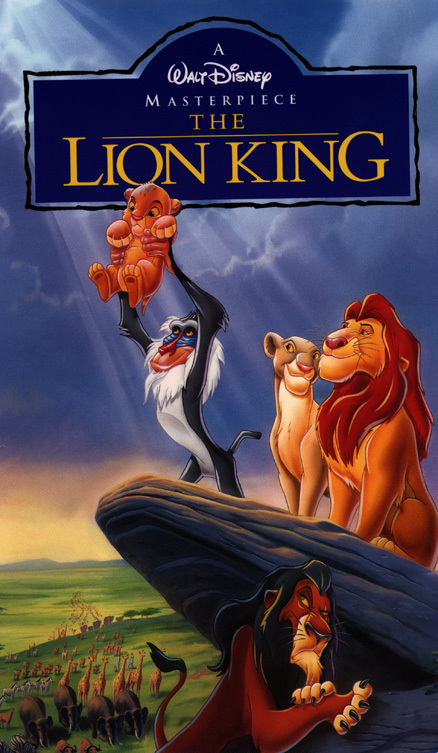 “The Lion King” is a 1994 American animated feature produced by Walt Disney Feature Animation. The film takes place in the African savanna and jungle, and was generally influenced by African animal behavior. The Lion King surrounds the adventures of a young lion, Simba, who is destined to be king, but must first defeat his evil Uncle, Scar, in order to take power. After being exiled to the jungle after the accidental death of Simba’s father, Mufasa, young Simba meets his life-long friends, Timon and Pumba. Years later, after Simba hears that Scar and the hyenas have taken over his home, Timon and Pumba accompany Simba back to the savanna to claim his title as king. Overall, The Lion King is a breakthrough Disney movie that offers innocent entertainment to its audience. In the grand scheme of things, The Lion King is definitely not the worst movie to watch despite its unintended racist undertones and limited view of Africa. Such undertones are conveyed through the dialect, the depiction of Africa’s geography, and the character portrayal. The hyenas in The Lion King have very distinct personalities for comedic effect, yet their three personalities subtly portray three minorities. Ed, played by Jim Cummings, has a small head and large ears which have bite marks on them. His eyes are always wide open and crossed, and his tongue often hangs out of his mouth. He constantly holds a crazy smile, and his famous for his uncontrollable laughing and drooling. On top of this, Ed does not talk. In short, Ed closely resembles a derogatory portrayal of someone who is mentally challenged. Banzai, Cheech Marin, is a grey hyena with black features and yellow eyes. He gets injured a noticeably large amount throughout the film and has a constant hunger. Shenzi, played by Whoopi Goldberg, is the last of the three hyenas who obey scar. Like Banzai, she is a grey hyena with black features, and she plays the role of “boss” with her sassy attitude. Cheech Marin is a Mexican-American man and Whoopi Goldberg, and African-American women. Interestingly, these actors’ races can be depicted in their dialect. Banzai’s and Shenzi’s dialect represent “the jive accents of a decidedly urban black or Hispanic youth,” while everyone else in the movie speaks in perfect British-English. Shenzi also symbolizes the “sassy black woman” stereotype. Furthermore, all three hyenas are ultimately indentured servants to Scar, dirty, uneducated, and living in an inferior environment from those in the Pride Lands. They are also seen as the evil characters. Ultimately, they represent three minorities--mentally disabled, African-American, and Mexican--for comedic effect. However, this “comedic effect” only perpetuates racial and minority stereotypes, allowing children to label those who hold these stereotypes as bad and amusing. Throughout The Lion King, we are only introduced to two environments, the savanna and the jungle. We are also never introduced to any native people. Although this was a calculated decision based on the intended audience--children would be more entertained by talking animals--it perpetuates the misconception about Africa that it is all jungle and savanna, and that animals roam the whole continent. Furthermore, the producers and screenwriters were not familiar with Africa, and most likely held many misconceptions about Africa that they unintentionally conveyed in the film. In fact, all the actors and singers are American--there are no authentic African actors, voices, or songs in the movie. Overall, The Lion King is a family friendly movie with lots of positive messages and offers wide entertainment to children. The only dangers lie in the representations of the hyenas and Africa’s geography; however, even as an adult it is difficult to see such racial undertones, and therefore, would be extremely difficult as a child. There is no outright racism in the film, and the coloring choices most likely represent the Western view of light and dark, that millions of other works of art depict. Concerning the limited portrayal of Africa’s geography: ⅓ of Africa is in fact savanna, and considering the audience of the film, an all-animal cast is most likely the most entertaining. However, it is important to acknowledge the misconceptions of Africa, and you should present your child with other perspectives of Africa in order to give them the most well-rounded and broad worldview.